If you need to find some tracts to hand out to kids, be sure to check out Let the Little Children Come for a great selection of unique evangelism tracts to share the gospel with children. We were given a set of Gospel Tracts and Evangelism Tools Sampler Pack to review and check out. 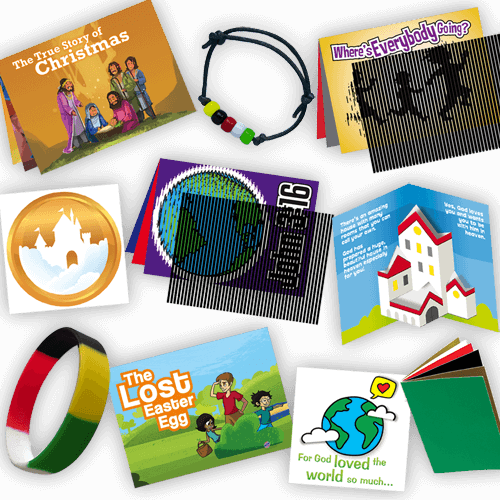 This sampler pack includes 10 of their most popular child evangelism items that they sell so you can check them out for yourself and see what might suit your needs best. Tracts are handy for community outreach projects, Sunday School goodies, party giveaways, or simply for sharing with out own family and friends. This sampler is perfect for children of all ages and includes one of each of the following: John 3:16 Animated Tract, Gospel Buttons FlipAbout, The Most Amazing House Pop-up Tract, Wordless Bracelet Kit (a salvation bracelet), The True Story of Christmas Animated Tract, The Lost Easter Egg Pop-up Tract, John 3:16 FlipAbout, Silicone Salvation Bracelet – Medium (great for older kids and teens), Where’s Everybody Going? Animated Tract, and a Wordless Book (to teach the message of salvation). Once you’ve seen all of the items, it’s easy to decide what you might want to order a full set of. Usually these items come in a set of 10 or 20. I like that the set includes Easter and Christmas items, as well as general salvation items and the John 3:16 things as well. To explain a little bit about how animated tracts, FlipAbouts, and pop-up tracts work, they included a little instruction sheet and a link to more information and video demonstrations as well. As you can see, these are quite a bit different than traditional, book-fold tracts. Kids love quirky little toys, and these totally fit the bill! While I was looking through the sampler, I thought that these might be good for a lot of different uses. Sunday school teachers looking for goodies for a prize chest, incentives for memorizing Bible verses, treats to hand out at Vacation Bible School, party favors at family festivals, or even handing out to members of the community at local missions. My daughter has been helping to hand food and other items to the homeless, and I think this would be something to consider handing out, especially to the children. The Wordless Bracelet kit helps kids to put together salvation bracelets. There is a rubber bracelet that carries the same idea as well. These are good for summer camps or other church-related groups that work with lots of kids in a social way. Having a bracelet-making activity as a group would be a good way to share the message of salvation while keeping their hands busy and minds more focused. This also comes with a prayer of salvation. I love the animated tracts the best, because they almost remind me of those decoder game sets from the 90s with the little overlay card that revealed the hidden message below. These work similarly, but when moved over the card itself, it reveals moving images! Super cool. I am saving these to give to my kids as random prizes. I like to surprise them with things out of the blue, and these are interesting and different without being yet another piece of candy or toy to break! There are so many uses for them, and it really showed me that religious giveaway items have come a long way since my own childhood!